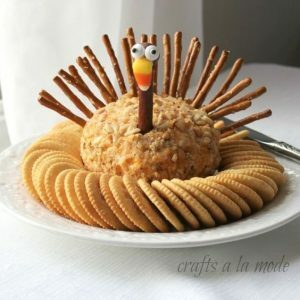 No, the cheeseball doesn’t contain turkey, but thanks to Pinterest, it can look like one. This is the look I was going for. You can check out this version here. I have made this cheese ball for several years and it delicious – a little messy but totally worth it. 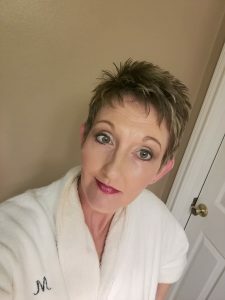 Since I have made a vow to myself to stop using the excuse that “I’m the old mom”, I decided to try to Pinterest up the holidays a little and be “extra” as my youngest daughter calls it! Let’s hope I don’t make the Pinterest fails page on this one! If you would rather skip my delightful post wittiness, you can download the PDF here. I doubt you will need it cause this is easy stuff! Some type of pepper seasoning. I have used this McCormick Perfect Pinch Roasted Garlic and Bell Pepper and I have used this Hot Shot by McCormick. You could also just use crushed red pepper flakes. 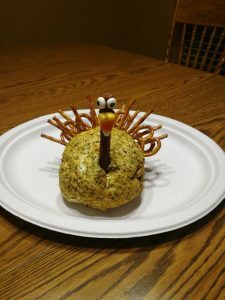 If you want to turkey it up, you will need some little eyeballs or you might be able to make some with cloves (if you like cloves), a beef stick, a bag of candy corn (you only need one so plan on eating the rest! #winning), a bunch of pretzel sticks and some melted chocolate to attach his face to his neck. Mix throughly with the Ranch. This part is a little messy. Roll it into a ball. I don’t have a good method for this, I just make a mess and get it into a ball shape. Cover it with plastic and let it chill. Now you can either roll it or heavy sprinkle the pepper seasoning on it and kind of pat it until it is completely covered. Voilà – easy peasy. This is great served with any kind of crackers, but my favorite is the Wheat Thin. Next, using the picture above, decorate it to look like that little guy! Here is what my actual dude looked like!